Swapped out the original head with a Ravenwing Command Beaky helmeted head. The Servo Harness arms really make it an interesting, if not over-the-top, model. Looking at the pictures, I now realize I forgot use the Micron pen on the purity seals. 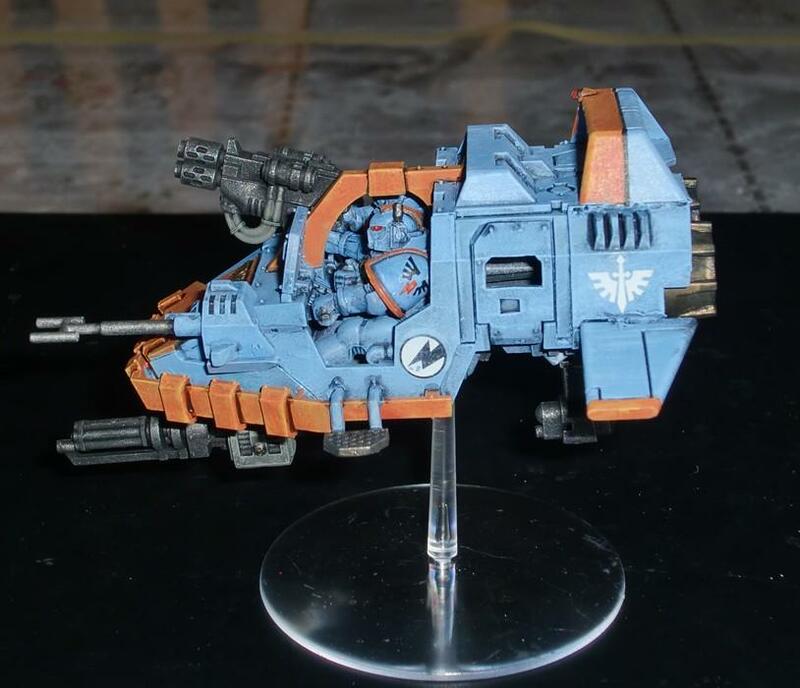 The right shoulder guard and weapon housings retain the Marauders' chapter colors. Just a quick update - finished the Servo-harness arms. Being magnetized and removable made them easier to paint. 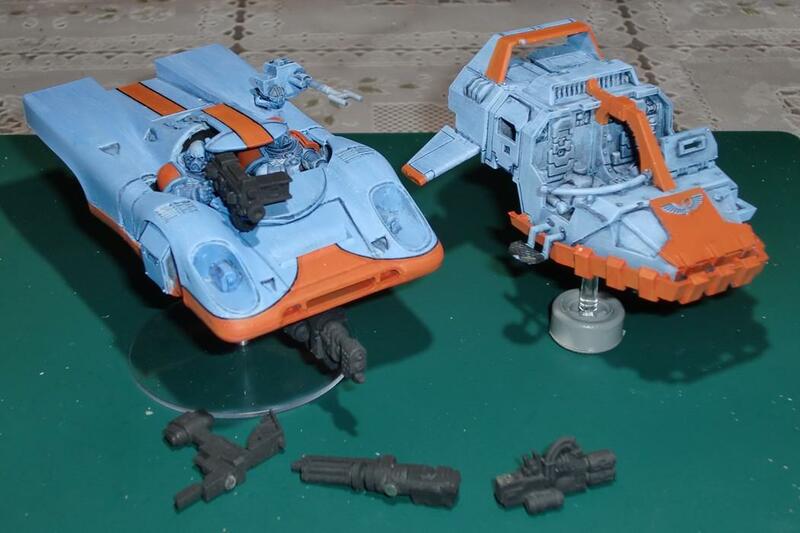 The arms were first sprayed with Krylon Silver and then given a wash of Vallejo Black Ink/Stain. The Marauder's Chapter colors can be seen on the plasma pistols. 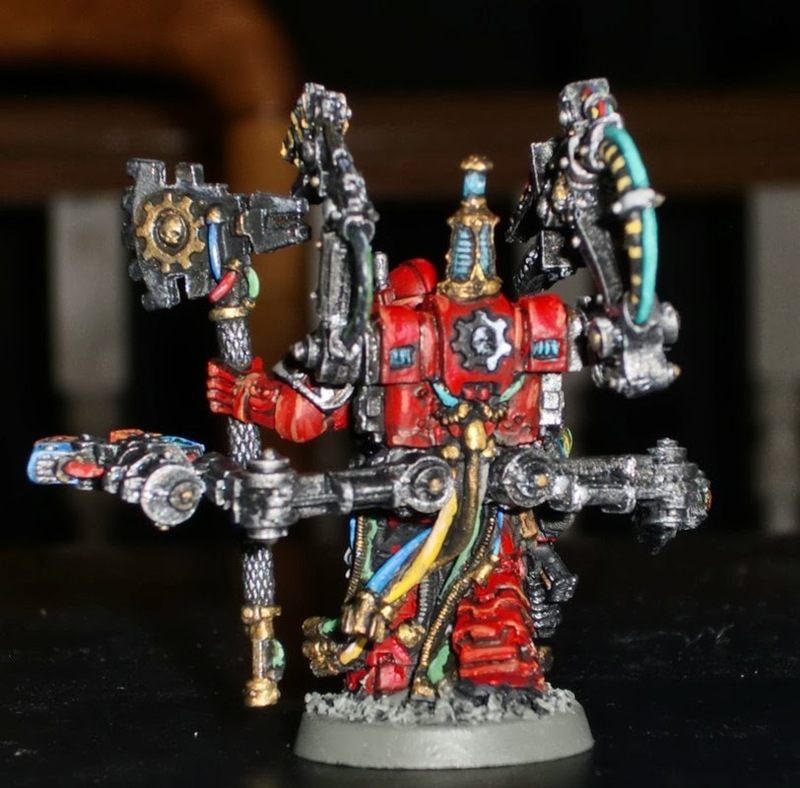 This is the Chaplain for McQueen's Marauders - in Terminator armor, no less. 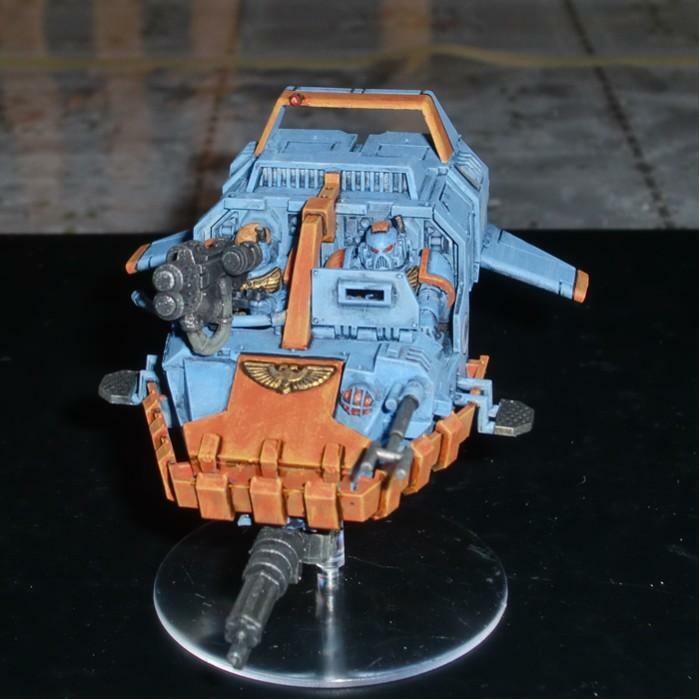 The black armor includes only a little bit of the chapter's colors - orange right shoulder guard and part of the bolter. With the basically black armor, this figures is fairly easy and quick to paint. Even the edging around the armor wasn't as bad as I thought it would be - thanks to the clear sculpting/details. I used an old Micron pen for the squiggly lines on the purity seals/scrolls. It was kind of dried up, so I may get another pen for stuff like this - it works pretty good for this. 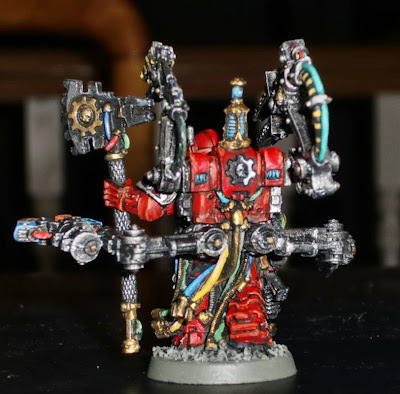 Next up is the Chapter Techmarine. 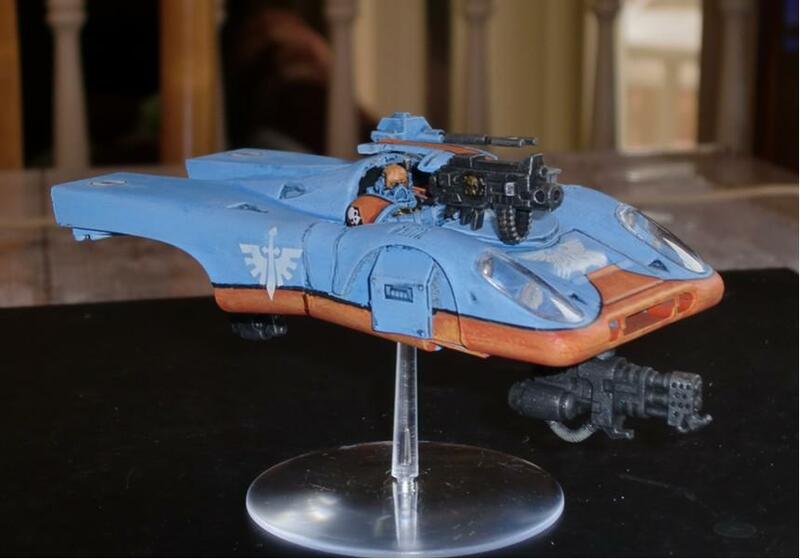 I plan to swap out his head with a Ravenwing Command head with a Corvus Mark VI "beaky" type of helmet. 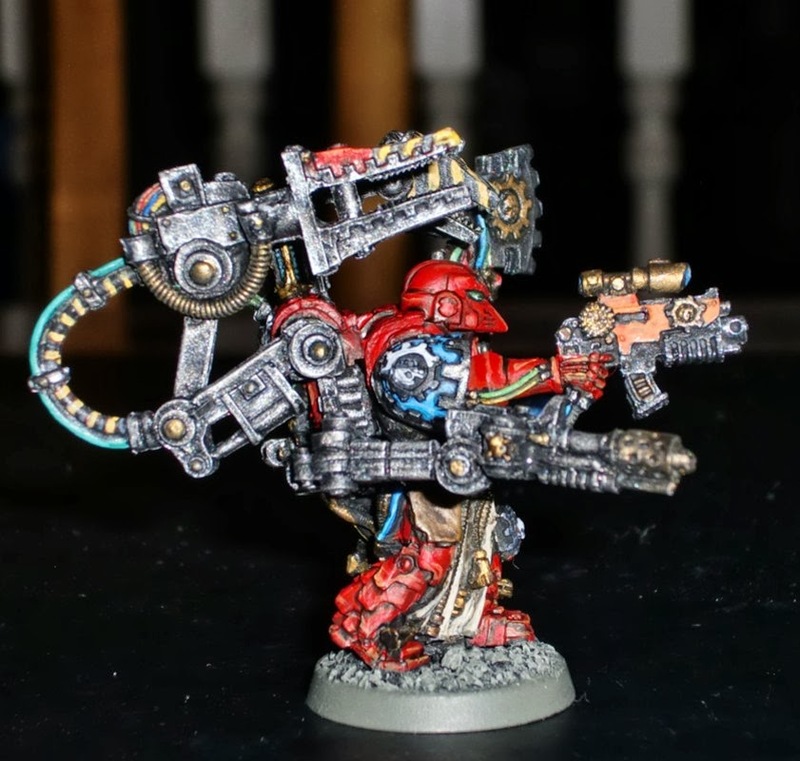 I magnetized all of the peripheral mechanism as well as the right arm with the bolter. 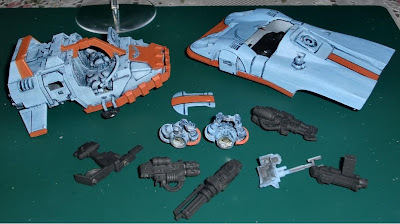 This allows the parts to move up and down a bit - as well as make them less likely to break as they just come apart. 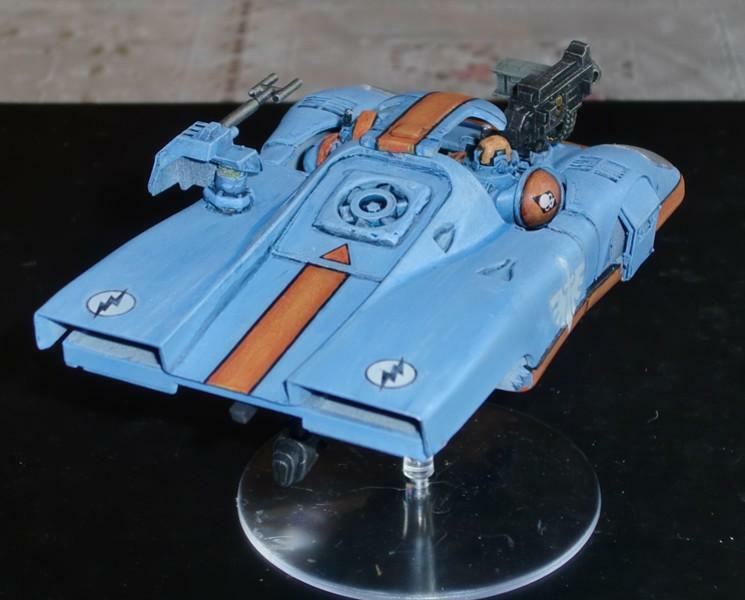 Here is the Land Speeder once piloted by Chapter Founder Steveonious McQueen from the days of the Great Crusade. No longer used in battle, it is brought out during ceremonial occasions in memory of Chapter Master McQueen. 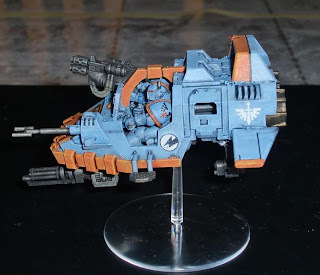 It could, however, still be a formidable vehicle on the battlefield if needed, especially with it's upgraded weapons systems. 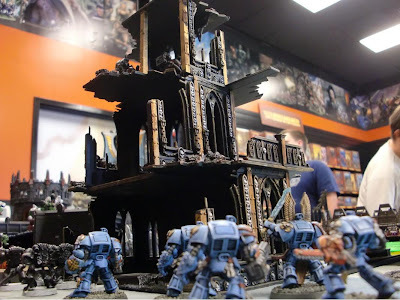 That said, it is still a cherished relic and is housed with the rest of the chapter's honored artifacts out of harm's way. 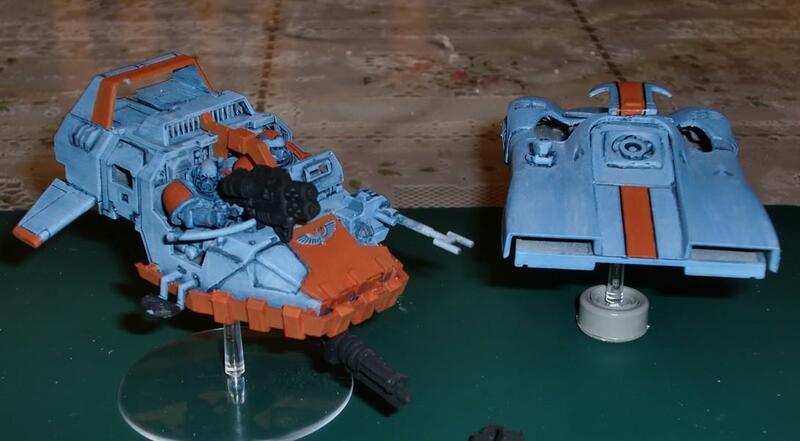 Here is the current version of the chapter's Land Speeder. Although not as fluid in style as the original, it follows the color pattern closely. 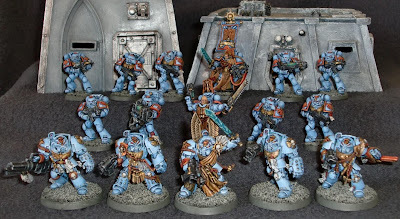 McQueen's Marauders are waiting for the arrival of their Chaplain in Terminator Armor and also a Techmarine. 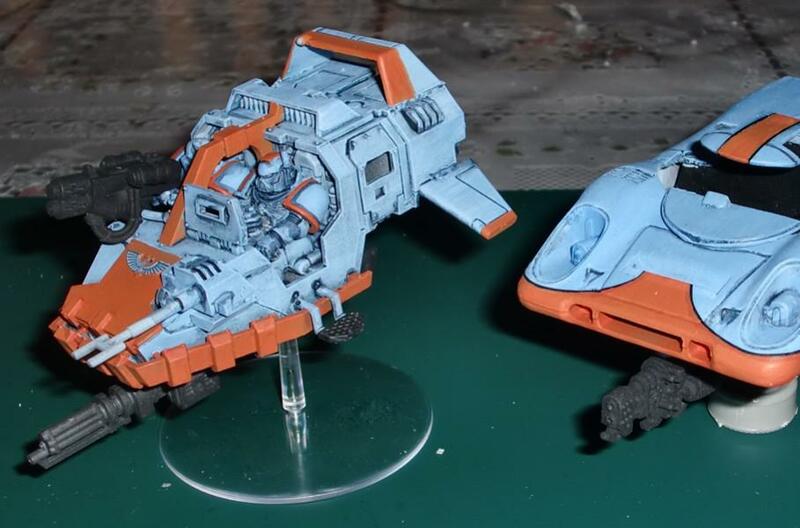 Just a quick update to show the basic color pattern - highlighting and decals still need to be added. This follows the color scheme of the famed Gulf Porsche 917s which dominated Le Mans in the early 1970's. 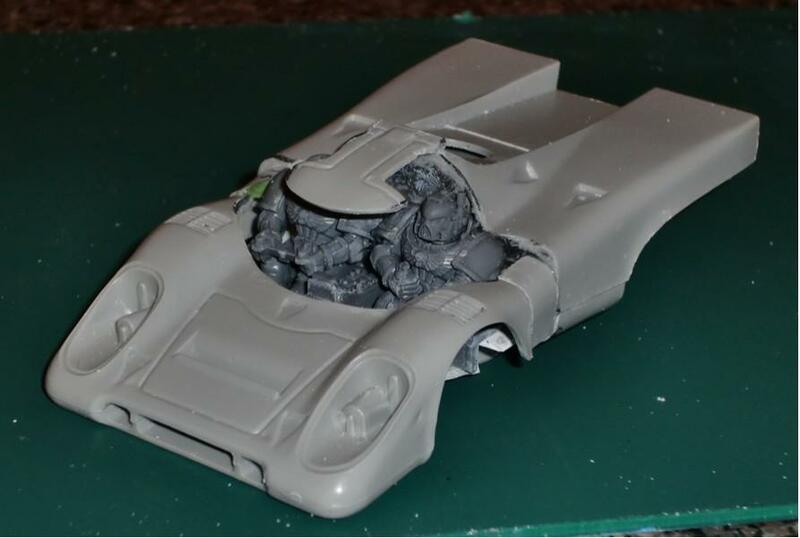 The 1:32nd scale Airfix Porsche 917 kit has been chopped and reconfigured to approximate the footprint of the GW Land Speeder. The crewmen, weapons and ancillary parts have been magnetized to allow the use of the Porsche model in friendly games with non-GW models. 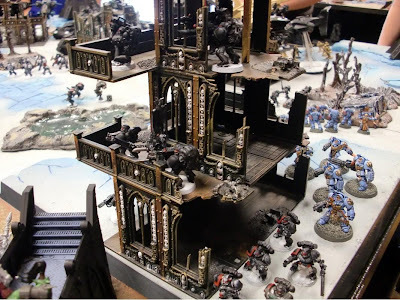 Conversely, the parts can be used on the proper-GW model for more model-restrictive games. 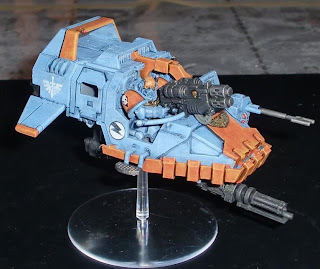 Here is the "regulation" GW Land Speeder. 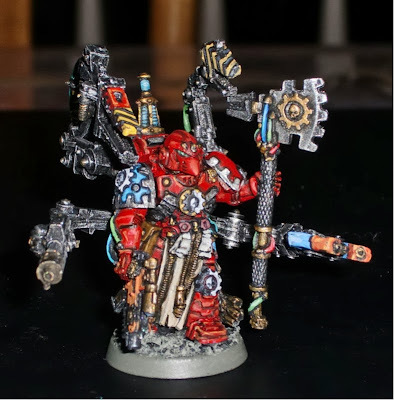 All weapons are magnetized and interchangeable between the two models. 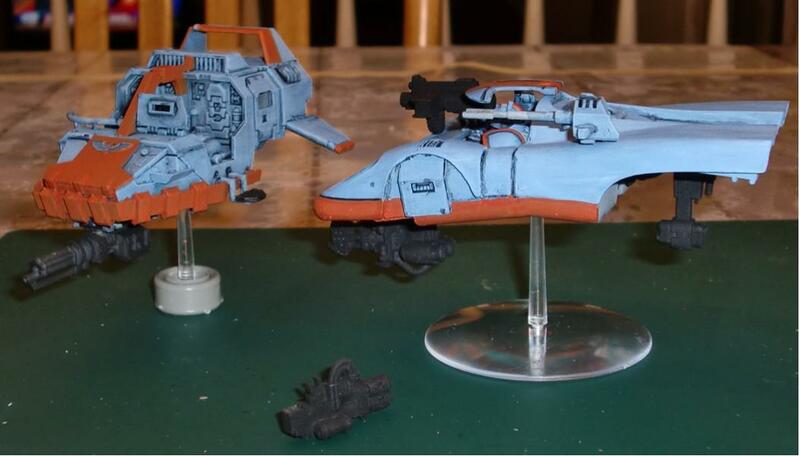 Here are the magnetized components off the models. I guess it's called "fortuitous" that I brought my Space Marines along with my Empire army for a Fantasy game today. 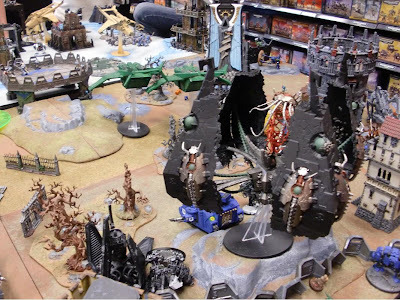 My buddy Pat (Socal Warhammer) invited me over to the GW Store across the Narrows Bridge ($5.00 toll) on his side of Puget Sound for a Fantasy game. I recall him saying he'd give the store a call to reserve a table for our game. 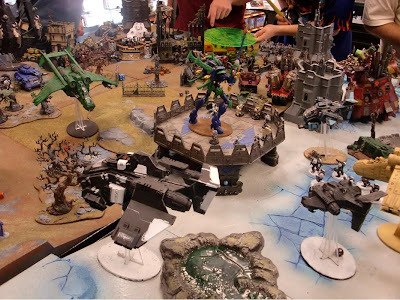 Lo and behold, I show up before Pat and there's a massive 40K Apocalypse game going on. 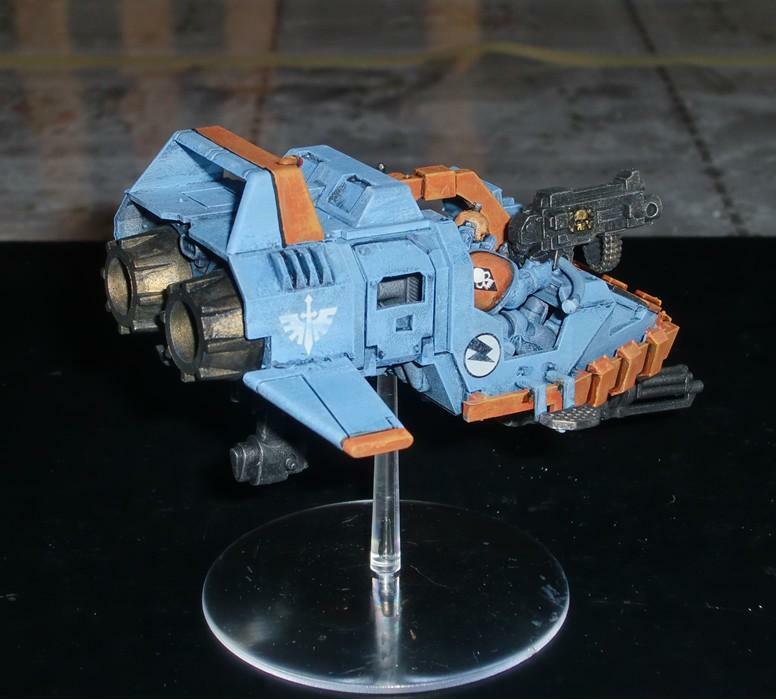 Having brought my recently painted Space Marines just to show them off to him, he suggested I get in on the game. The local crew were super cool in getting my feet wet and I had a great time. 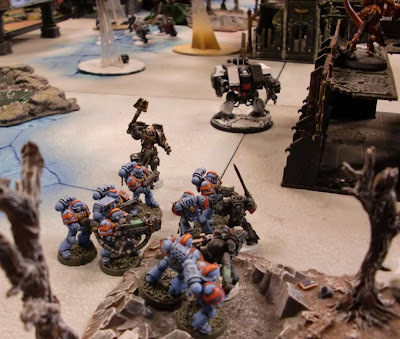 McQueen's Marauders Terminators moving up for an assault. 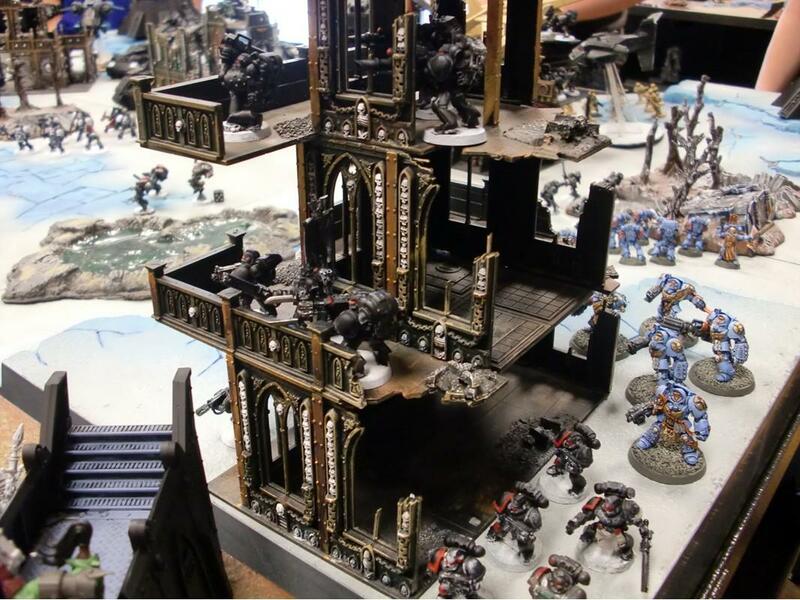 The Terminators wiped out the enemy Space Marine unit. The Tactical Squad did well too - even after losing their Sergeant when his plasma gun overheated and blew up. They did well enough without him against the enemy's Chaplain too. 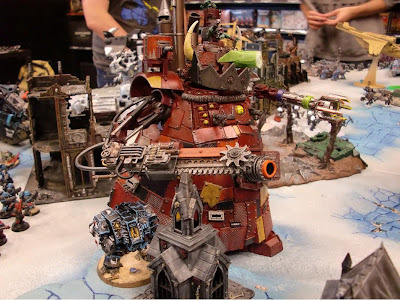 A huge Necron thingee - not sure of the exact nomenclature. No idea what all of the models are called, but there were a ton of them. 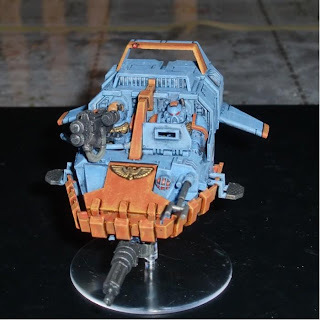 I believe this one is called a Stompa? It looked awesome. 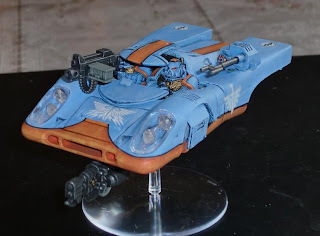 As an aside, here is a something I am working on - kind of like a Frankenstein's monster right now, but it will, hopefully, be a Land Speeder for McQueen's Marauders. It's based on a 1/32nd scale Airfix Porsche 917 model kit I picked up off of ebay. Went ahead and based them using coffee grounds mixed with sand for the flocking. For the coloring of the bases, Vallejo Field Grey and Green Grey were dry-brushed over a black basecoat. The colors were chosen mainly because I had them from painting up WW2 Germans in the past - and it looked close to what I envisioned their planet LeMans' ground cover might look like. Terminators out in front of the Tactical guys, as well as the Captain in the center rear. The buildings are from another close-out sale many years ago - I bought them for my youngest son who used to play with Star Wars figures. 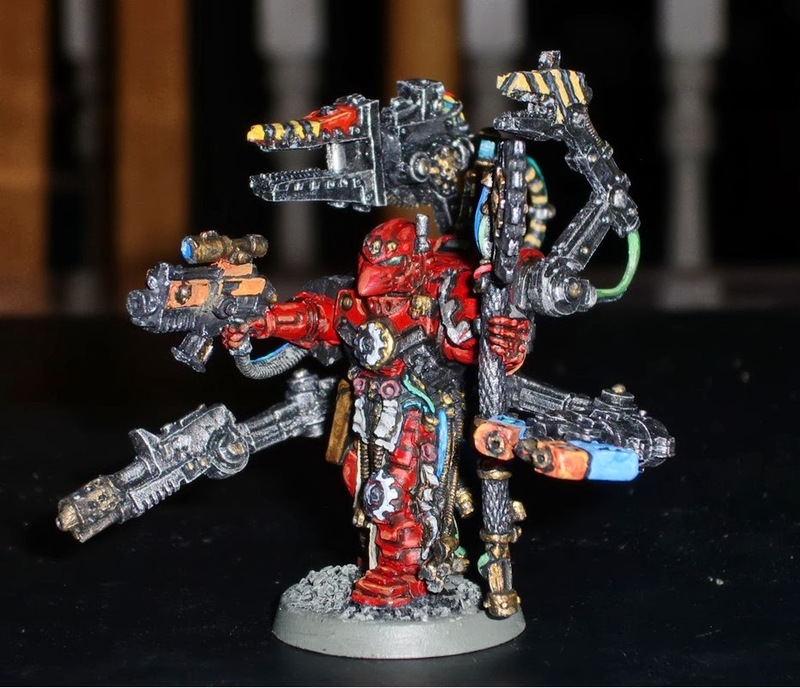 Never thought I'd use them myself, but they look perfect for 40K.